We’d love your help. Let us know what’s wrong with this preview of The Dragoneers by C.D. Sutherland. To ask other readers questions about The Dragoneers, please sign up. I have been a fan of the fantasy literature genre ever since I was a child. I have eagerly read and enjoyed many books such as the the Harry Potter series, the Lord of the Rings, the Inheritance Trilogy, the Dragonriders of Pern, and the Chronicles of Narnia. I was therefore excited by the idea of this book. However, Book One of the Chronicles of Susah is different from all of these other series I mentioned - this particular book is set in historical places, coincides with ancient events, and is I have been a fan of the fantasy literature genre ever since I was a child. I have eagerly read and enjoyed many books such as the the Harry Potter series, the Lord of the Rings, the Inheritance Trilogy, the Dragonriders of Pern, and the Chronicles of Narnia. I was therefore excited by the idea of this book. However, Book One of the Chronicles of Susah is different from all of these other series I mentioned - this particular book is set in historical places, coincides with ancient events, and is peopled with some familiar (and some not-so-familiar) characters. The idea of a time-forgotten, strong feminine-character from thousands of years ago is enchanting! I found myself saying, "Aha!" as the story unfolded and I saw this spitfire of a character filling in the spaces between the concise Biblical accounts of these events. I also very much enjoyed the mental picture developed by the story of what the world might have looked like before the catastrophic flood as told in Genesis. The speculation of an ice shield is something I've never encountered in my readings before. The way that this younger, less-tainted Earth was described is fascinating to me. The idea of people from early Biblical times having advanced technology is also something I've not read before. Alternative power sources, advanced weaponry, and the ability to see and hear things that are invisible to most other people make the story of a catastrophic, world-wide flood even more devastating! To think if technology like that had existed before the flood, it has taken civilization over 4000 years to even come close to "reinventing the wheel", so to speak. I have very much enjoyed this book. It has a quick pace, and excellent descriptive imagery. I found the violence and demonic activity to be intense but believable. The description of society fouled by a tangible demonic presence was disturbing, but it also makes you pull for the heroine and the humans all the more. THIS NOVEL IS A TRAP: It will totally ensnare you! Like the MASTER, feeding the 5000 with a few pita breads and some sardines, Sutherland has taken a few scraps of information [what the Bible gives about the world before the Flood of Noah] and has adeptly multiplied those crumbs into a grand, miraculous world of high fantasy, filled with dragons, giants, physical demons, and a host of other dangers. And it is a world populated by a very few brave souls who are willing to stand against the all too THIS NOVEL IS A TRAP: It will totally ensnare you! Like the MASTER, feeding the 5000 with a few pita breads and some sardines, Sutherland has taken a few scraps of information [what the Bible gives about the world before the Flood of Noah] and has adeptly multiplied those crumbs into a grand, miraculous world of high fantasy, filled with dragons, giants, physical demons, and a host of other dangers. And it is a world populated by a very few brave souls who are willing to stand against the all too prevalent evil. WARNING: This fast-paced story is one of those actioners that is impossible to put down once you are swept into and captured by its fantastic world. The characters are so believable, that you feel you are right there with them in their joys and struggles; urging them on to overcome their flaws, wanting to help them in the conflicts thrust upon them; rejoicing in the triumphs of the good, and cringing at the plotting and heartlessness of the wicked. The ultimate battle of good and evil. The young woman Susah has strengths and powers she doesn’t realize as of yet, she has a hint in that she can hear the thoughts and feelings of others. Others are pulled into the lairs of Lilith, evil at its worse, but Susah has the discernment to sense evil. After seeing pa The Dragoneers, what an awesome book, blended with fact, fiction, imagination, and wonderful dragons. If I had to compare this book with any other….I would say “along the lines of Narnia”. The dialogue is inpeccable and the writing is flawless! I thorou I love how the author starts off the novel and continues to drag the reader in with the mental picture he conjures up for us. It is my belief that only an amazing author can do this for readers. I absolutely loved this book. It's completely different from any other story I've read. It's like L.Ron Hubbard meets Frank Peretti. Anyone who enjoys Lord of the Rings or Harry Potter or The Inheritance Trilogy will enjoy The Dragoneers. I like how C.D. Sutherland creates an alternate history that is so different yet believable. Susah is a great heroine; the ogres and fallen angels were disgusting and creepy just like good villains need to be. I really was on the edge of my seat and the action s I absolutely loved this book. It's completely different from any other story I've read. It's like L.Ron Hubbard meets Frank Peretti. Anyone who enjoys Lord of the Rings or Harry Potter or The Inheritance Trilogy will enjoy The Dragoneers. I like how C.D. Sutherland creates an alternate history that is so different yet believable. Susah is a great heroine; the ogres and fallen angels were disgusting and creepy just like good villains need to be. I really was on the edge of my seat and the action scenes were gripping. This book is definitely difficult to close once you open it. This story would make an incredible movie! At first I was hesitant at reading this book. I’m usually not into these kinds of books, but once I started the journey, it pulled me in and I couldn’t put it down until the last page was read. Some of the things I enjoyed were the blending of Biblical stories that we’re all familiar with, advance technologies with a little Sci-Fi thrown in the mix. Although it’s fictional and set in a time prior to the Biblical flood, who’s to say they didn’t have the means back then? Sure everything was destro At first I was hesitant at reading this book. I’m usually not into these kinds of books, but once I started the journey, it pulled me in and I couldn’t put it down until the last page was read. Some of the things I enjoyed were the blending of Biblical stories that we’re all familiar with, advance technologies with a little Sci-Fi thrown in the mix. Although it’s fictional and set in a time prior to the Biblical flood, who’s to say they didn’t have the means back then? Sure everything was destroyed in the flood, so how do we know they did or didn’t have the knowledge back then? Anyway, loved the book and can’t wait for the next one in the series! Fantastic Read. I loved every word. Charles has successfully done the impossible and brought a religous story most of us know and love and added a wonderful science fiction/fantasy element to it. It is superbly written and the plot is brilliantly orchestrated. My hat is off to you Charles. Keep it up. P.S. I love the salute to our old squadron, and thanks for making the EWO/Defender a solid character. This is one wild ride, first time author C.D. Sutherland has done a epic speculative fantasy. Susah is Noah's daughter and an animal lover, while going to Sethopolis for a shopping day meets danger and adventure beyond all imagination. Susah determines that she wants to become a Dragoneer and defend Eden. Dragons with both one and two heads, Ogre's, Hogres, Giants, Fallen Angels and much more await Susah in this first of a planned 11 books. I think it was the best of luck that I read this book blind. I simply liked the title, and as it was discounted, I got it on a lark. As I read, I realized that the main character is a daughter of Noah, she has a way with animals, and she's still trying to sort herself out in the world--she's coming of age. By the start of the second chapter, I was very, very excited for what awaited. The setting of the book completely captured my imagination. Sutherland brings together some of the best gems of sp I think it was the best of luck that I read this book blind. I simply liked the title, and as it was discounted, I got it on a lark. As I read, I realized that the main character is a daughter of Noah, she has a way with animals, and she's still trying to sort herself out in the world--she's coming of age. By the start of the second chapter, I was very, very excited for what awaited. The setting of the book completely captured my imagination. Sutherland brings together some of the best gems of speculative science, a remarkable insight into the martial arts, and a number of imaginative leaps together with a surprisingly familiar culture and social fabric. I think it's safe to mention that Nephilim figure into the story, but Sutherland goes beyond the basics that I've seen in other stories of the genre, at least 7 or 8 of which I have read during this last year alone. "The Dragoneers" stands head and shoulders above the whole lot. Susah has strengths, talents, and weaknesses, a family with "baggage," and an itch to leave the nest and test her own wings. That's enough for any teenage girl to sort out, never mind the worldwide flood looming around the corner. It's a wonderful setup, and this Book 1 of the series gets things started right. Even the beginning of this book has surprises. I knew before I began it, that it was loosely based on Genesis and set in Antediluvian times. I did not know that Sutherland has created a world of wonder and great accomplishments in technology so that the long ago world is quite similar to ours. Yes, I was surprised to find innovative ways of transportation, shopping similar to ours today and even the same sins we see in today's world. Though that last shouldn't have surprised me I suppose. After Even the beginning of this book has surprises. I knew before I began it, that it was loosely based on Genesis and set in Antediluvian times. I did not know that Sutherland has created a world of wonder and great accomplishments in technology so that the long ago world is quite similar to ours. Yes, I was surprised to find innovative ways of transportation, shopping similar to ours today and even the same sins we see in today's world. Though that last shouldn't have surprised me I suppose. After Satan is an ancient creature and his servants are ever present. I'm a sucker for anything dragon, and started reading this book to discover more dragon riders. It took a very long time to get to the dragons but they were worth the wait. The book has a mix of Biblical characters living in a world with modern inventions, but protecting the Garden of Eden from anyone entering. Susah is the daughter of Noah, who wonders why her dad is building the big boat. She can see auras and speak mentally with animals, which is a huge advantage when she finally becomes a dr I'm a sucker for anything dragon, and started reading this book to discover more dragon riders. It took a very long time to get to the dragons but they were worth the wait. The book has a mix of Biblical characters living in a world with modern inventions, but protecting the Garden of Eden from anyone entering. Susah is the daughter of Noah, who wonders why her dad is building the big boat. She can see auras and speak mentally with animals, which is a huge advantage when she finally becomes a dragoneer. Interesting read, I enjoyed the play on an alternate biblical world with a sci-fi twist. Question: What's more awesome than a fire and ice breathing dragon? Answer: the person that has the ability to command and control one. Using a female protagonist initially sounded far fetched, but then how could any human have such ability? Susah proves herself to be the unlikely nearly-superhero as she submits to the tough training while retaining her spunky spirit. A most excellent adventure. I may be a little biased in this review, this book contains an exciting adventure of a previously unheard of heroine, with unique experiences, which mix spirituality, martial arts, military doctrine, folk lore, and legend with the book of Genesis, taking care to not violate actual scripture while telling an extreme fantasy story. All of this suggests, there really is more to the story. The Dragoneers are.... yep, dragon riders. This story is okay, but it's really not my thing, hence the two stars. Although it may have dragons that could make for an interesting story, my expectations were way off course. I was thinking more like the Eragon kind of dragon riders. This, however, is a very unusual story of Susah, 17 years old, daughter of Noah, son of Lamech, son of Methuselah, descendant of Adam. Yes, THE Adam from the book of Genesis of the Holy Bible. Sutherland has taken these The Dragoneers are.... yep, dragon riders. This story is okay, but it's really not my thing, hence the two stars. Although it may have dragons that could make for an interesting story, my expectations were way off course. I was thinking more like the Eragon kind of dragon riders. This, however, is a very unusual story of Susah, 17 years old, daughter of Noah, son of Lamech, son of Methuselah, descendant of Adam. Yes, THE Adam from the book of Genesis of the Holy Bible. Sutherland has taken these characters and built a new environment for them, where Sethopolis is a modern city and citizens drive gravilectric powered vehicles that zoom through the air and hover above the ground. The military force include the elite team of warriors-- the Dragoneers, whose sole task is to defend and protect the Garden of Eden. No one is allowed to enter this zone. “The Dragoneers” by C.D. Sunderland tells the story of Susah, the daughter of Noah, and descendant of Adam. Susah is gifted and talks to animals. Her father, Noah, is distant, and preoccupied with building a boat. The unthinkable happens when Susah visits Sethopolis, and family members are killed. Susah senses a calling and joins the Dragoneers and enters battles to protect Eden. This book was confusing. It takes the familiar story of Genesis and significantly rewrites it. The reader struggles t “The Dragoneers” by C.D. Sunderland tells the story of Susah, the daughter of Noah, and descendant of Adam. Susah is gifted and talks to animals. Her father, Noah, is distant, and preoccupied with building a boat. The unthinkable happens when Susah visits Sethopolis, and family members are killed. 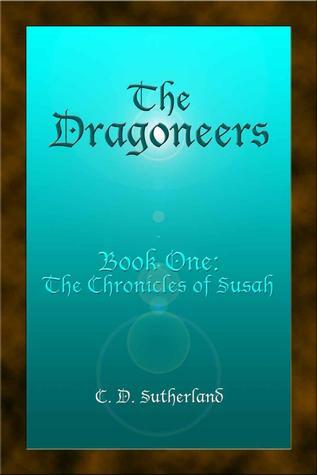 Susah senses a calling and joins the Dragoneers and enters battles to protect Eden. This book was confusing. It takes the familiar story of Genesis and significantly rewrites it. The reader struggles to keep up with cars and gravilectric systems and fusion generators. There are not only multitudes of characters, but also the opposing cultures of humans, ogres, hogres, nephilium, fallen angels, daemons, and giants… and then there are flying dragons. The author plans a total of 11 books in this series, but it seems this may just be a delusion of grandeur. The dialogue suffers and the grammar definitely interferes with the story. The reader has to pause to understand what the author was trying to say, given all the grammar and spelling errors and remember how this fits into the rest of the story – which by then is forgotten. I think so much time has been to develop the “other-worldly” technology and other aspects of the book that the characters have suffered. I liked Susah. She is capable and strong, but otherwise she and other characters are simple and one dimensional. Evil characters have infiltrated the army, and the Dragoneers. The parts where there are twists and maneuvering in events and outcomes tended to be better written. Overall, I wanted to like this book and its story. I bought this when it was free on Amazon Kindle because the premise sounded interesting… but I will probably not join any of Susah’s future journeys. it did have stylistic issues and a lot of editorial errors..still, it interested me enough that i finished it out and wasn't sorry i had...prob would have liked it a lot more in my late teens-early twenties...has a bit of the contemporary YA feel to it.. I was . . . confused by this book. I admit to a teeny fascination with dragons that started when I was a little girl. I love the lore -- especially brave knights like St. George and the Dragon -- or the newer Eragon and Donita K. Paul's DragonKeeper Chronicles to name a couple. This book had plenty of action, but it didn't seem clear whether it was Biblical fiction - retelling the story of Noah's Ark, or fantasy - going into dragon riding warriors who talk with their minds to animals and people I was . . . confused by this book. I admit to a teeny fascination with dragons that started when I was a little girl. I love the lore -- especially brave knights like St. George and the Dragon -- or the newer Eragon and Donita K. Paul's DragonKeeper Chronicles to name a couple. This book had plenty of action, but it didn't seem clear whether it was Biblical fiction - retelling the story of Noah's Ark, or fantasy - going into dragon riding warriors who talk with their minds to animals and people . . . or futuristic with biodegradable clothes and weapons and vehicles using magnetic energy from the earth's core. Add several mixed races (resulting from fallen angels mixing with humans) with various abilities and sorcery -- lawlessness and a general disbelief in God . . . and I wasn't sure what kind of story I was reading or where it was going. On a recent trip I read The Dragoneers. Immediately I liked Susah and became intrigued by her father, Noah. I also enjoyed the character of the Lead Dragoneer Dachux. This work is very creative and I applaud C.D. Sutherland on the melding of a biblical story with new ideas. I am giving this book a 3.3 star rating. I would be inclined to give a 4 star rating if the book arrived at some of the key points more quickly. I like plot development but this book takes to long to develop. I often read Sci- On a recent trip I read The Dragoneers. Immediately I liked Susah and became intrigued by her father, Noah. I also enjoyed the character of the Lead Dragoneer Dachux. This work is very creative and I applaud C.D. Sutherland on the melding of a biblical story with new ideas. This amazing adventure of a budding heroine in the antediluvian world is interesting and compelling. Mr Sutherland crafts a fantasy world with fallen angels, giants, and flying dragons which is fresh and thought compelling. Those things are just the background as the story focuses on Susah, but those things along with the amazing technologies caused me to consider that Mr Sutherland's fantasy story might be closer to truth than other stories I've been told lately. I'm a fan of this series, just This amazing adventure of a budding heroine in the antediluvian world is interesting and compelling. Mr Sutherland crafts a fantasy world with fallen angels, giants, and flying dragons which is fresh and thought compelling. Those things are just the background as the story focuses on Susah, but those things along with the amazing technologies caused me to consider that Mr Sutherland's fantasy story might be closer to truth than other stories I've been told lately. I'm a fan of this series, just started book two. ummm... religious undertones that i wasn't expecting confused me. Noah was father... cousins to marry Susahs brothers... "blasters", dragons, and giants... garden of eden...i didn't get it. Born in Virginia, to the son of a coal-miner, who escaped a life in the dark Appalachian mines by jo C. D. Sutherland is a B-52 pilot turned novelist with his THE CHRONICLES OF SUSAH series. These novels defy conventional classification as they blend action and emotional tension with technology and spiritual intrigue in a coming of age story wrapped in an epic adventure set in the antediluvian age.